DUBAI, UAE - April 2012 : Emirates customers travelling to the United States will soon enjoy seamless connections to a dozen U.S. cities, after the airline announced the start of a one-way codeshare with JetBlue. "Emirates' network within the United States will soon extend to almost 20 cities through our partner JetBlue, making flying to the U.S. from the Gulf, Middle East, Africa, the Indian Subcontinent and the Far East smoother and more convenient than ever before," said Thierry Antinori, Executive Vice President of Passenger Sales Worldwide. "JetBlue shares our passion for innovation and best-in-class services, and we look forward to continuing to grow the relationship as we seek new ways to build our presence within the United States," continued Mr Antinori. "We are pleased to expand upon our successful relationship with Emirates through this new codeshare at JFK, where JetBlue is the number one airline," said Scott Laurence, JetBlue's Vice President of Network Planning and Partnerships. "Emirates has been a terrific travel partner for JetBlue, affording our customers easy access to all corners of the globe in comfort and style." Emirates customers can connect to JetBlue services at New York's JFK Airport. As a one-way codeshare, an Emirates' flight number will be placed on JetBlue services to the following cities: Boston (BOS), Burlington (BTV), Buffalo (BUF), Charlotte (CLT), Chicago (ORD), Fort Lauderdale (FLL), Jacksonville (JAX), Orlando (MCO), Portland, Maine (PWM), Raleigh/Durham (RDU), Tampa (TPA) and Washington Dulles (IAD). At JFK Airport, Emirates operates from Terminal 4 while JetBlue operates from the adjacent, 26-gate Terminal 5, allowing for easy connections between flights. In addition, the Quick Connect service available at JFK makes transfers even more hassle-free. Available to all customers with a confirmed onward flight departing within three hours of their Emirates' flight arrival, Quick Connect enables customers to advance to the head of a specially designated passenger security checkpoint lane at their connecting terminals. 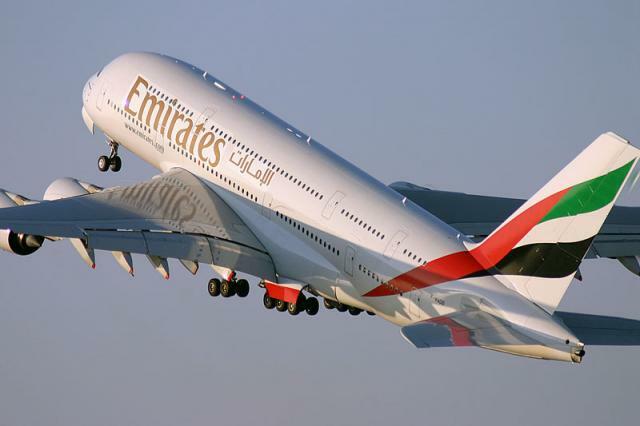 The service also extends to baggage, with Emirates arranging the transfer of baggage on to the connecting flights. Emirates currently offers two daily non-stop flights to JFK - including service aboard its flagship Airbus A380 and its ultra-long range Boeing 777-300ER. Winner of over 500 international awards, Emirates' unique service offering includes complimentary chauffeur-driven airport transfers for premium customers, privacy suites in First Class, and an inflight entertainment system featuring over 1,200 channels of new release Hollywood movies, TV, music and games. The Emirates Lounge at JFK Airport was named one of the Top Airport Lounges in North America by Frommer's Travel Guides in 2011. The lounge, which is available to First Class and Business Class customers as well as Skywards Gold members, offers a spacious and luxurious seating area, a selection of fine food and beverages to suit any palate, shower facilities, complimentary massages and a fully-equipped Business Centre with independent work stations and complimentary broadband and wireless internet access. JetBlue is the leading carrier at JFK Airport, where it offers premium, low-fare service to dozens of cities throughout the Americas. Known for its award-winning customer service, JetBlue will offer transfer customers from Emirates' network of global destinations a premium experience that includes all-leather seating, unlimited free snacks and drinks, plus the most legroom in economy class (based on average fleet-wide seat pitch) and the most free live entertainment of any U.S. airline. Emirates' network now encompasses 123 cities globally, served by a fleet of 171 aircraft which are among the youngest in the skies. Emirates' flights to the U.S. now serve six gateways, with daily services to Dallas/Fort Worth (DFW) and Seattle-Tacoma (SEA) having launched in February and March this year. The airline will start non-stop daily flights to its seventh U.S. destination Washington, DC on September 12th 2012.